Get out from under the kotatsu, put on your winter woollies, and get outside to admire some of Kansai’s majestic snowscapes. As the new year begins, the autumn color has long since fallen from the trees, and the days become shorter while the nights get colder, some people will be celebrating winter by dusting off their ski goggles in anticipation of hitting the slopes. Others, however, will retreat under their kotatsu hoping to emerge again when the spring is safely upon us. But there is another group of people, treading somewhere in the middle ground, who rather like the brisk temperatures and get excited at the thought of a slight dusting of snow. While much of Japan disappears under many meters of snow from December until well into late spring, for those of us living in the big cities of Kansai it can be easy to forget what a snowflake even looks like, such is the rarity of proper snowfall within the city limits of Osaka or Kyoto. But luckily, you don’t have to travel far to get your snowy fix for the winter. Here are a few places that almost always get a decent smattering of the white stuff, particularly if you visit in January or February. Koyasan is a small temple town high up in the mountains towards the south of Osaka. The area is well-known as the heart of Shingon Buddhism, and here we can find the sect’s main temple, Kongobuji, along with hundreds of other sacred sites. Koyasan is a popular place to visit at anytime of year, but winter usually brings a smattering of snow which gives the old town a mystical feel, and the famous Okunoin cemetery transforms into somewhere truly otherworldly (particularly at dusk). If possible, try to combine a visit with a stay in one the many temples, where you can enjoy a hearty feast of winter vegetable dishes (strictly Buddhist, so no meat) and relax in the warm and serene surroundings, safely tucked away from the biting cold outside. Not too far from Koyasan is the highest point in Osaka prefecture, Mount Kongo. At 1,125 metres tall, the peak is arguably the best place to see snow in Osaka, and makes for a relatively easy day hike from the city. At weekends, throngs of people queue up early for the buses which deliver hikers to the foot of the mountain, and it’s then a case of huffing and puffing your way up to the top, where there is usually a few inches of snow throughout the winter. The mountain attracts all sorts of folk, from serious older hikers with elaborate arrays of hiking gear, to yama girls (mountain girls) in their brightly colored kit, to young families carrying sledges and bundled-up babies. The biggest draw in the winter is the juhyo, beautiful frosty ice-covered trees, and amateur photographers with expensive-looking equipment vie for the best photo spots along the trails. The peak is rather over-developed, so anyone expecting a peaceful escape to nature may be disappointed, but the hut on top offers warm noodles and drinks which may be very welcome to those who easily feel the cold. Most of the trails up the mountain are very clearly marked and simple to follow, but it may be wise to bring some small snow spikes or four-point crampons just in case the paths are icy. North of Osaka and always a little colder, Kyoto sees more snow flurries during the winter months, and the mountains surrounding the city are always a good bet for those eager to see a bit of winter whiteness. The culturally significant Mount Hiei is just northeast of Kyoto, lying right on the border with Shiga. The Buddhist temple complex of Enryaku-ji is a tourist hot spot for most of the year, but in the quieter winter months it takes on a more peaceful, reflective tone, made all the more magical if there’s been a light sprinkling of snow. There are a bunch of trails connecting the various historical sites on the mountain, and cable cars offer an easy way up from either the Kyoto or Shiga sides. The “marathon monks of Hieizan” are famous for the practice of kaihogyo – 100, or occasionally as many as 1,000, consecutive days of long-distance walking. But visitors here can take it slightly easier, and just enjoy the fantastic views out toward Lake Biwa instead. Almost directly across from Hieizan, in the northwest corner of Kyoto lies Mount Atago, another towering peak with a sacred shrine on the top. The 924-meter mountain is a straightforward climb, but sees its fair share of snow in the cold winter months. From the small village of Kiyotaki (access by bus from Kyoto station and Arashiyama), the path winds its way steeply up the mountain, and the whole hike should take between three and five hours to complete. Alternatively, a short 30-minute train ride on the Eizan line from Kyoto’s Demachiyanagi station will whisk you to the picturesque village of Kurama, with its nearby hilltop temple and brooding forests. The station is in a shaded valley which tends to mean snow sticks around for longer, and the area is a pleasant afternoon getaway from the city. 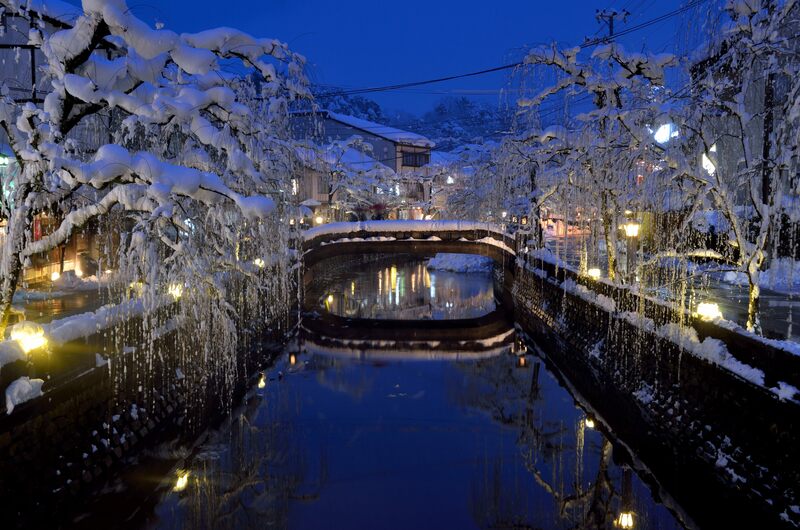 Slightly further afield, the attractive spa resort of Kinosaki is regularly blanketed in snow come winter season, and visitors can escape the cold by taking a dip in one of the many enticing hot springs. So if you hear the winter calling and simply must feel that soft snowy crunch beneath your feet, there is no need to make a long trip north to the likes of Hokkaido or Nagano, as there are plenty of winter wonderlands to enjoy here on our doorstep. App For a New Start? My Number: What should I know?